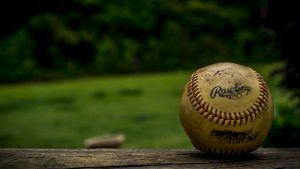 When searching for the best sports memorabilia for a man cave, you must do you research as to what sites are the best in terms of what you are looking for. Some go for autographs, some for rare items, and some for a wide spectrum of items that make the room look fuller regardless of what the item is. Whether you are looking for autographed helmets or cleats, unique team mugs, or even rare jersey or items, you need to know what places to look and which places offer the most variety. Below is a breakdown of the top 4 sites out there to get what you need at the right price with the right options. Range: Autographs, Jerseys (EVEN GAME USED), Apparel, Trading Cards, Photos, etc. Some of the best sports memorabilia can be found hidden in the abyss of the internet. Press Pass Collectibles is one of the best sites in terms of variety across all spectrums, allowing you to see a large amount of products in a large a lot of categories. Whether you are looking for phtographs, equipment, or custom pieces, Press Pass Collectibles has it all either autographed or as is. Additionally, Press Pass Collectibles grants you the ability to spend as much or as little as you want on as many items as you want. Quite often we see websites with autographes upsell their other items to match the price range of the high end content they are trying to sell- this site does not do that! You want a mini helmet for under $50? Done. Or are you feeling like splurging for a game used autographed jersey? They have it! The variety here is truly amazing- you will feel like a kid at a candy shop! However, the one the putting Press Pass Collectibles even higher in the memorabilia echelon is the fact that they also sell music and celebrity related items too. Where else online can you find all this at a reasonable price? Well, we have a similar option below! Range: Autographs, Jerseys, Apparel, Trading Cards, Photos, Furniture, etc. This is literally the center of the internet. Amazon has everything you could possibly imagine From toilet paper to total home renovations, you can literally search anything and there will be results. When you have a site idea of what you want, you type in the search and look at the best options for that idea. Don’t have an idea yet? That is ok too, just type in a broader idea and you will get results. Not sure if you want nfl, nba, or soccer related memorabilia- just type in sports memorabilia and look at what options bet fit you. Hell, get a little from every option and stress less! The disadvantage of this is the possibility of second guessing everything, as there are thousands of options for each category. For instance, if you were to type in your favorite sport team, you would get a large amount of results. What do you buy? Or when you do buy something, did you overpay? The hard part of navigating through these large sites is the tunnel vision it creates. People tend to think that because one site has it all, it has it for the best prices. Smaller sites that specialize in particular areas (like Press Pass collectibles specializing in sports) give you a smaller price range for a better product. These larger sites can price how they want as they will make money from one of their million other products. Fan Shop HQ is one of the smaller websites that offers products for the major sports found in the United States. In the 4 major sports (and NCAA), their product variety range is wide, ranging from mugs and wall decor all the way to baby bibs and pacifiers. This is a site for a true fan of one particular team in one particular sport. I have literally purchased a variety of products from here to deck out my friend’s baby with the correct apparel to become the biggest little fan out there! The down side of this site is how condensed it is to just a few sports. For people outside the Americas, Fan Shop HQ does not allow you to purchase much in the soccer (or football/futbol) section. There are a few braclets and mugs, but nothing that is of major value to decorate a man cave. If you are looking for cool man cave decorations that covers a sport not in the United States market, this would not be the site for you. And then we saved the best for last! The website is literally named for what we all are looking for. 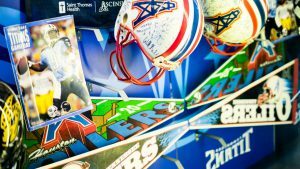 Similar to Press Pass Collectibles, SportsMemorabilia has everything from autographs to mini helmets to both game used and unused jerseys and apparell. They literally have the 1965 Vince Lombardi game worn jacket! That is at the most extreme end of the price spectrum, but it does show you that they take the time to find, research, and sell the best products to their customers. 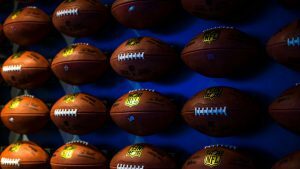 If you are looking to decorate your man cave with a collection of mini helmets or larger helmets, or even your own custom jersey, they have so many options that will leave you working overtime to get them all! The benefit of this that puts SportsMemorabilia at the top of our list is the website’s ability to add products covering all sports for all decades. Unlike Amazon, they do not over populate their products with high priced items to make “the big sale”- they truly care about what their customers want and what products should and can be readily available to them. You don’t have to settle with just 1 site! Each of these sites provides their own content on what products you can purchase. Determining what products you want for what price is the largest determining factor in any purchase- these sites understand that. Whether you are sticking to one sport or all, you can’t go wrong with any site listed. If you have any questions on these sites, or even others you recommend, feel free to comment below! Wow. Once again, this is a well-done article. I’m not a sports fan, but I can certainly appreciate this niche. Just for kicks, I’m going to visit Press Pass Collectibles to see what a Mickey Mantle signed bb would cost. Great site. Thank you and they have such a huge collection of sports memorabilia. To top it off, they have other memorabilia for music and celebrities as well! Super cool! I am a huge baseball fan and would love to pick up a signed baseball from one of the Rockies players for my dads birthday. I knew about amazon, because who doesn’t, but Press Pass Collectibles I will have to check out. Do you know which site would be best for what I am looking for? Hi Preston! Pass Press Collectibles is probably your best option for sports related memorabilia. I Live in Rockies country now and see signed balls from them quite often. I can do a little research around here and see if there are any signings going around and if so, post it to the site! Thanks for a great list. I have been thinking about investing in some sport memorabilia as an investment. If it is mostly for investment purposes and for hoping to be able to later sell again and make a profit, what kind of sport memorabilia would in your experience be best to look into? If you are looking to purchase something for an investment, I would look towards some of the older big names in sports. Current players are more prone to sign memorabilia at a higher rate than older ones. Hall of fame players from early 1900s tend to sell at a drastically higher rate than that of current ones, as there are far more options out there for current players. I’ve ended up on your site because I’m a little bit nervous about the purchase I am about to make for my son. You see, he’s a huge Liverpool FC fan and he want’s something autographed by Steven Gerrard. Of course I can’t get close to this celebrity so the next best thing is to come online and purchase some memorabilia…problem is I’ve started to hear horror stories about signed products. Steven Gerrard has been the face of Liverpool for quite some time and that would be a worthy purchase for your son! Amazon is the best option in my opinion, as they have begun shipping products out to the UK for a little while now. The shipping costs aren’t bad at all, and once a price range is hit, I believe they waive shipping all together. I must say I have a little experience with sports, but you have been straight forward in explaining the best places to buy these products. Amazon sure has the best prices offer. I always order from Amazon. Although I am not familiar with the other website, I am curious about some things: Do they also sale different products like Amazon do? They specialize in selling products related to the sport theme. Amazon is the largest online sales company, as they specialize in selling anything that possibly exists in this world. If you are looking for something pertaining to a specific thing (sports for instance), it is better to purchase it from a site that specializes in that one thing, as they have a better variety and more unique items. As a big sports fan, these sites seem to be the gold mine for all the memorabilia.One thing I’ve seen with some sites though is that their shipping regions are very limited. I know Amazon ships pretty much anywhere in the world, but are you aware about the others. I’m currently out of the states, so if I were to ship one abroad, does it allow me to do so? I think a huge market also exists abroad so I don’t get why a lot of the shipments aren’t done international. These sites specialize in shipping to the US, but the can ship elsewhere. A lot of companies shy away from that due to the costs of taxes and all that – so they shy from it and try and stay local to their countries. With Amazon setting the standard for product shipping and development, more companies are shipping further across the globe. I am quite passionate about autographs and apparel. Which of these sites can provide me quality assurance for a better price? My Talk is to collect more than 100 photographs of the sports Legends so I Just Wonder where I can get them for a reasonable price thanks for sharing all these websites I will definitely check all of them but for now I only buying from amazon. Sports Memorabilia is the best in my opinion, followed by Press Pass Collectibles. These two sites specialize in what you are looking for, and they don’t waste time trying to sell a million other products like Amazon. Amazon has a great deal of options at reasonable prices – but if you want something unique or sports specific, the other two sites are your best bet for sure. Hi there, I have never been in a mancave but I found myself fascinated with the concept. The Press Pass Collectibles you linked to look like they would make perfect feature points in such an environment! I did have a question though, how would you display all the stuff? Are there proper shelves or wall displays for this? You have a nice site I enjoyed poking around. Press Pass Collectables is an amazing site and has everything you could dream of. In terms of displaying memorabilia, you could do so in a display case, bookshelf, bar area, or entertainment center. Also, depending on the type of memorabilia, you could display the memorabilia on the wall as well. The shelving for the walls is really dependent on the look and feel of what designs you want! Press Pass Collectibles is one of the best sites out there, and the fact that you can get multiple Christmas gifts from there is perfect! I hope you find what you are looking for.